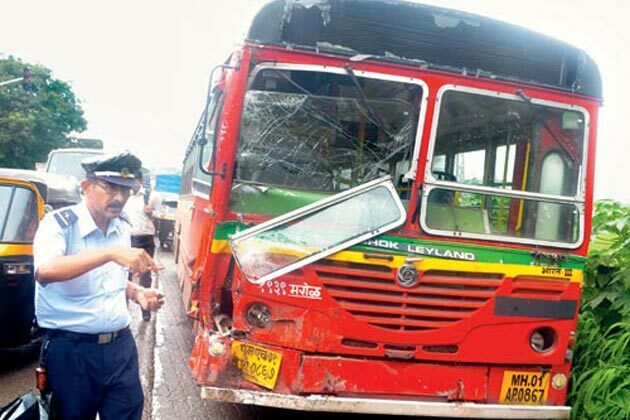 Mumbai: BEST has devised a new three-pronged strategy to curb accidents with its fleet. BEST has written to the state government to set up more CCTV cameras on streets. BEST wants to be able to monitor its drivers en route, monitor their driving skills and safety, and identify corridors where accidents are common. This should be extended to the buses too. One would wish that the requested CCTVs are for the exterior of the bus too, something which currently only the Volvo fleet has: A CCTV camera on the top of the rear window panel that can be monitored by a display next to the steering wheel.All BEST buses, barring the Volvo fleet have two CCTV cameras in them, as part of the agreement with Verve Compusoft for the PIS and Advertising system. However, BEST themselves are unsure as to how many of them are functional, and like the PIS, it is also in bad shape and nothing can be done due to a badly enforced contract. While more CCTVs is one thing, whether they will be properly utilised, is another thing. BEST has decided to get smaller tyres for its buses, as a alternative to installing a speed governor. While this might be great for certain routes, care must be taken and larger tyres must be present on buses that ply on Express or Long Distance routes such as A74Express or A8Express which ply on the Bandra-Worli Sea Link and the Eastern Freeway as well as go on top of almost every flyover on the Western and Easter Express Highways respectively. 6,500 new tyres will be fitted in 775 Tata buses (out of the total 3,800 buses that BEST has) and will be procured at a cost of ₹4.72 crore. The older nylon tyres are 9.00 x 20-14PR while the newer nylon tyres will be 9.00 x20-16PR. Speed Governors are mandatory on heavy vehicles like buses, trucks and trailers under the Central Motor Vehicle Rules of 1989. The Undertaking will also install newer mirrors. The new mirrors, with a dimension of 380mm x 190 mm is being tested. The existing mirrors are 40% smaller. If they are found to be useful, it will be retrofitted into 303 new buses and then gradually into the rest of the fleet as well. Overall, BEST seems to have done a great deal of study to reduce accidents. We wish them all the BEST (pun intended) and hope they succeed. The CCTVs on the roads and in the buses will be really useful. Here in Kochi, buses in certain routes run screaming mad! I have always wondered why not limit the speed in such buses while manufacturing them! Why would a bus carrying passenger need a speed of 100km/hour? The only thing that speed can do is kill people. The Undertaking is changing the size of its nylon tyres, mainly as an alternative to speed governor that regulates the speed of vehicles and keeps it under permissible limits. The move has come at a time when the Road Safety Week was on to keep an eye on traffic violations and speeding vehicles in a bid to curb accidents. Previous Previous post: The Amish Buggy is High-Tech, Why Can’t Our Victoria’s Be The Same? Next Next post: Uber Movement: Can it help us solve our Transport Problems?